In colonial Virginia, it was observed that many a local person met the morning by drinking a “julap.” Rather than a mint julep chilled with bourbon in a sterling cup as we know it today, the colonial julap was a strong concoction of rum, water and sugar. Taken in the morning, it was more medicinal in use – something akin to knocking back a Pepsi and a Goody’s powder each morning as I used to do in college. 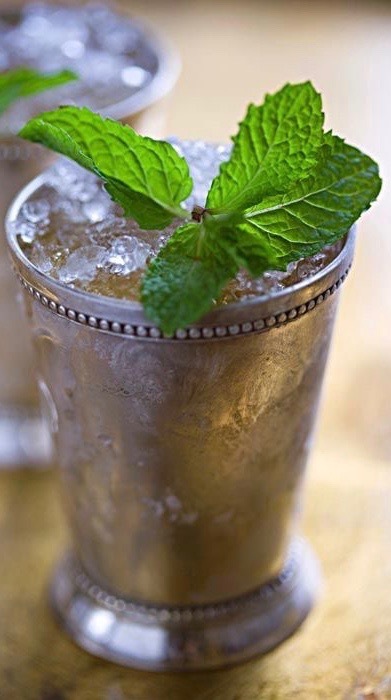 As tastes were refined in the antebellum South, mint and brandy were added to the recipe, rum was dropped and the proverbial silver julep cup was forged. After the wealth was gone and the yankees had stolen the sterling cups, bourbon replaced brandy as the cheaper alternative. Reconstruction required a julep, even one with home sourced whisky. I have been told that Reconstruction juleps can be found in red solo cups to this day. Since mint grew easily, it remained as the only proper garnishment reminding us of greener days that were a long time coming. My grandmother grew mint throughout her yard, plantings that dated back to the pre-Depression days when my grandfather built the place. I remember my dad picking it for his afternoon glass of iced tea during his daily visit to her house. No mint juleps during the hot afternoons for us Baptist folks. A morning julep – a restorative – something needed to boost the spirits and chase away the aches and anomie of the night. I won’t mix up a pitcher of juleps for you each morning as I do not advocate drinking nor am I encouraging anyone to do so, but I can attempt a literary version of a morning julep every now and then. These restorative posts will contain snippets of what I have read and found amusing as I wander the dark corridors of sleepless nights. The posts will also be much shorter, mercifully for all of us. General Motors formally exited Europe this week with the sale of Opel, their only remaining automotive manufacturing subsidiary, to Peugeot. With the sale, GM abandons an 88 year history of lackluster car manufacturing in the EU. Maybe GM knows more about Trump’s NATO plans than we do. Nothing says that I’m confused and almost immobile like Opel and Peugeot, the Merkel and Macron of the automotive world. I’ve known two people who owned Opel and Peugeot automobiles. Each person also owned an identical spare car to use when the other wasn’t running. GM was smart to get out. Gone are the days when Obama and his appointees ran GM. Deep-sixing Opel reminds me of the GM ran by Bob Lutz who once said “Work is not supposed to be a relaxing, rewarding social activity. It’s supposed to deliver results.” Indeed. A lesson for many politicians and some post-college X-Box players whose work ethic is evident in their work avoidance. Previous Post Johnsoncare and Obamacare and Trumpcare, Oh My!